This fall, the cosmic corner of the universe goes weekly as Marvel will release a new cosmic comic just about every week under the banner "Realm of Kings." Marvel Comics ? where Spider-man and Wolverine hail from ?has a long history of injecting science fiction into stories, especially withintheir line of comic books that take place in the far reaches of space. In Marvel's latest creation "Realm of Kings," ahero composed purely of energy ventures through a tear in space-time to anotherreality. But what are the science facts behind this epiccosmic storyline? 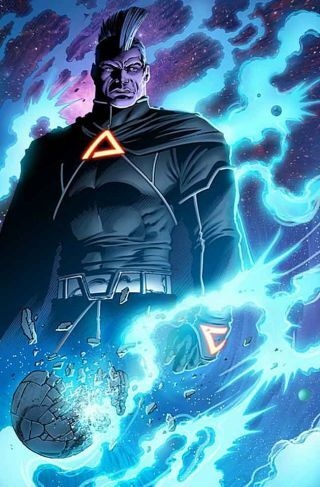 The one-time Avenger known as Quasar has become one with thequantum bands, which transformed him into "pure quantum energy." As Einstein discovered more than a century ago, mass can getconvertedto energy, and vice versa. A single gram of matter holds an extraordinaryamount of energy ? more than 20,000 tons of TNT, more than the bomb dropped onHiroshima ? and anyone wielding that much energy could certainly be capable ofacts of cosmic heroism. According to quantum physics, all forms of radiant energycome in packets known as quanta, so "quantum energy" might refer toany of them. A truly bizarreform of energy that quantum physics suggests exists is vacuum energy ? theenergy that exists in space even when devoid of matter. Under the uncertainty principle, one can never preciselyknow both the position and velocity of a particle, so one can say countless"virtual particles" constantly pop in and out of existence in vacuum,each of which could exert force. Evidence for both virtual particles and vacuum energy hasbeen detected over the years. Some physicists have suggested there is enoughenergy in a coffee mug's worth of vacuum to boil all the oceans on Earth.Others more conservatively estimate it at roughly 350 trillionths of an erg,less than a thousandth of the mass-energy of an electron at rest. One consequence of quantum physics is the 'many-worldsinterpretation,' which suggests a virtually infinite number of universes exist,altogether comprising every possible outcome to every event ? including,perhaps, the truly horrifying possibilities seen in "Realm of Kings." But how would one adventure to another universe? The answercould be increasingly familiar tears in the space-time continuum known aswormholes. Einstein proposed that mass and energy curve space-time, creatingthe force we know as gravity. One consequence of his theories is that enoughmass or energy concentrated in one place can warp space-time enough to createdistortions allowing shortcuts in space, travel back in time and even voyagesto other universes. The main problem with any concept involving wormhole iskeeping them open enough for travel, as they naturally want to slam closed andform black holes. However, physicists speculate that bizarre phenomena such as exoticmatter or phantom energy could render wormholes traversable. Exotic mattermoves in the opposite direction of normal matter when pushed, while phantomenergy might be driving the accelerating expansion of the universe, potentiallyone day tearing apart galaxies, stars, planets and even atoms in a "BigRip." As unfathomable as exotic matter and phantom energy seem,they are both currently theoretically possible ? another fantasticpotential element in the cosmos-spanning "Realm of Kings."